I know for sure my computer hardware isn't good enough to see the difference, and I have not yet had a photo printed out that was processed through LR. But can someone tell me the difference(s) between the three outputs? Has anyone looked closely enough to see any differences? Does anyone understand the gory details of the software to explain what is going on with the three different way of outputting a JPEG? Inquiring minds want to know (well, at least one). When I export jpegs out (shot in jpeg under studio conditions for school formals/proms only) I don't have those choices, I am on LR 4.5, and to be honest I don't think it would make one iota of difference unless viewed under the Hubble Space Telescope. 99% of stuff is printed on Matte anyway. I have had stuff printed on Glossy/Metallic papers, no difference. 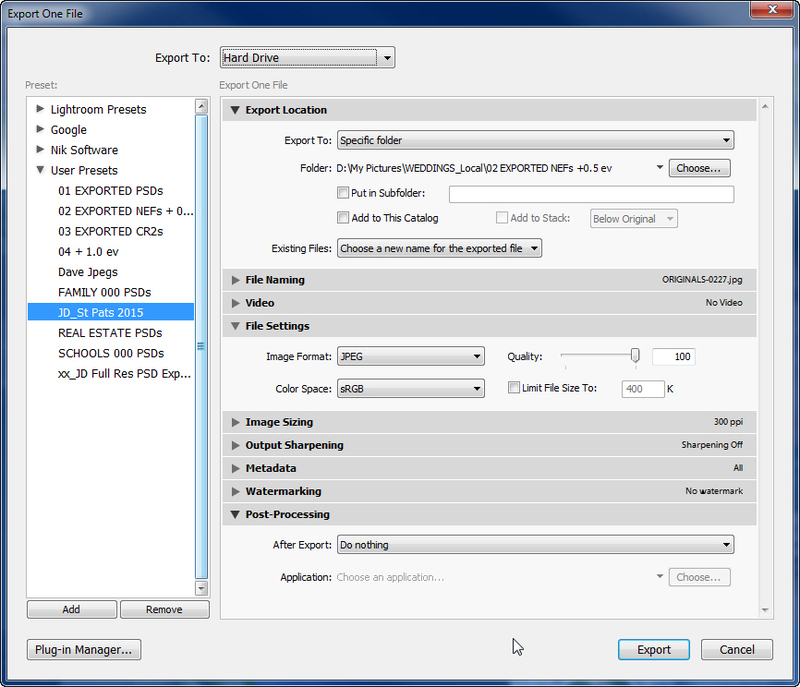 Here is my jpeg export window, only thing is full quality mode and no re-sizing. So what area do you see these choices? Trev - I have LR 5, and it's under "Output Sharpening". There are drop down menus for "Screen", "Matte", and "Standard", and well as the amount of sharpening "Low", "Standard", "High". aahhh, I've never used that, since I just apply sharpening if needed on the jpegs within the Detail Tab and no output sharpening. I think if you try to mix them up you could end up with some really whacked out results. Mate, the best thing you can do is output with NO output sharpening on an image, then output it again and crank up the sharpening on output and choose Matte, then get both printed, not small, around 12x18 or even an 8x12 to see if you can spot the differences. 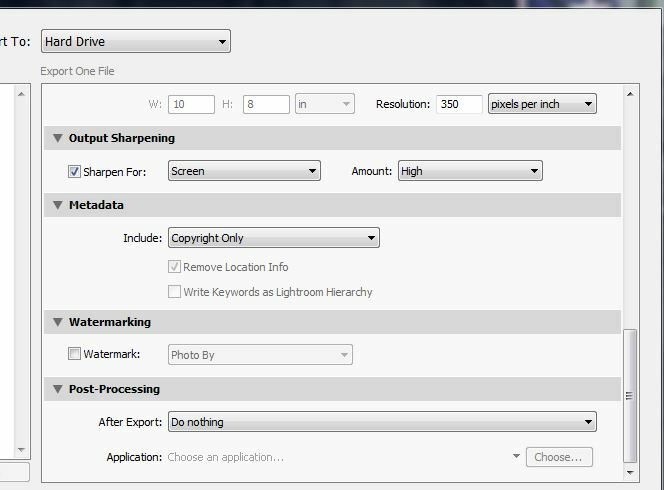 Sharpening is a very controversial thing and if you were to search 'sharpening in LR' you would get 10's of 1000s of results, and probably the same amount of 'expert' opinions. The one thing I can tell you Dave, if you are working on a good monitor, you need to have sharpening juuuust a tad 'over' on the screen, since screen resolution and paper prints are 2 entirely different things, and paper will 'absorb' sharpening a little during printing as compared to when looking at it on a pixel basis on screen res. Another fallacy I hate is when people tell you that you 'need to look at sharpening at 100% on screen', to that I say crap. If you enlarge you screen image to 100% you are looking at almost 'pixel' level and it will look terrible and you will have a tendency to under-sharpen and getting an image back in print form it will look soft. I always judge sharpening at 50% size in Photoshop. Doing it that way if a normal full res camera you are looking at say an almost 12x18 'looking' image on screen sizewise as it fills the screen so therefore in principal you are looking at almost what a print would look like in real life sizewise. If I do jpegs in LR like studio set-up for formals/proms, they are shot jpeg, and have anything set in camera embedded, like contrast/sharpening etc. but I still do a little work on them, like open Fill Light a tad, and maybe a little more contrast and a bit of sharpening. If I do normal stuff like weddings, etc. I take off sharpening altogether and no contrast and just adjust exposure and WB then export out as PSD's, and do full edits in Photoshop where I have lots more control with sharpening via masks to protect skin tones instead of a 'global' sharpen from LR. You can control what Lightroom sharpens using the masking slider under the details tab. If you hold down the alt key when moving the slider, you can see what is going to have sharpening applied to it. It is very effective and I have never felt the need to use PS for sharpening. I also use output sharpening depending on whether it is for screen or print, never used more than Standard. Always been pretty happy with the results. Rarely pull anything into PS these days, LR does pretty much everything I need for weddings and landscapes. Braveheart - pretty good tips, thanks. I didn't know about the "Alt" key trick, or maybe I'd forgotten it.